Kaburu Muguika, is one of the various African entrepreneurs I meet with at the Sankalp Forum this year. He is the CEO of Prosoya Kenya, a food processing company sourcing from small-holder farmers for processing and sale at affordable rates. As we speak, he articulates a clear mission for his visit to India – scouting for Indian suppliers for some of their produce, which is seasonal in nature, so they can ensure year-round supply of maize, sorghum, millet and soy beans. Public sector’s role in fostering collaboration: While multi-lateral agencies have made several attempts in the last couple of years to specifically take innovations from India to Africa (USAID’s Power Africa program being case in point), Seema Panthaki, economic advisor to DfiD India, acknowledged the limitations of India’s foreign services budget and priorities in this area. India’s corporate sector on the other hand, has started seeing the opportunity for growing in Africa (as witnessed by recent efforts of Indian orporate conglomerates Reliance Industries and Bharti Enterprises to expand in Africa) and social enterprises too are more likely to lead the way, as opposed to governments creating the path. Ecosystem development: Established and young social entrepreneurs alike shared that the presence of intermediary/ consulting and mentorship ecosystems could go a long way to smoothen operational expansion across the two regions. A market-entry could happen in one of many ways – by setting up a subsidiary; through a franchisee model; as a supplier of technology, among others. Some form of knowledge sharing on these basic aspects of doing business in each other’s regions,was a need many expressed at Sankalp this year. Many impact investors now span across both the regions. For its part, Intellecap has made a commitment to continue to grow its presence in Africa, with Sankalp Africa in February 2014 being one of the first steps in this direction. The Millennium Alliance (USAID; DfiD; FICCI; ICICI etc) too is considering expanding the alliance to Africa over time – the question is are we doing enough for now or will entrepreneurs continue to reinvent wheels in both markets? 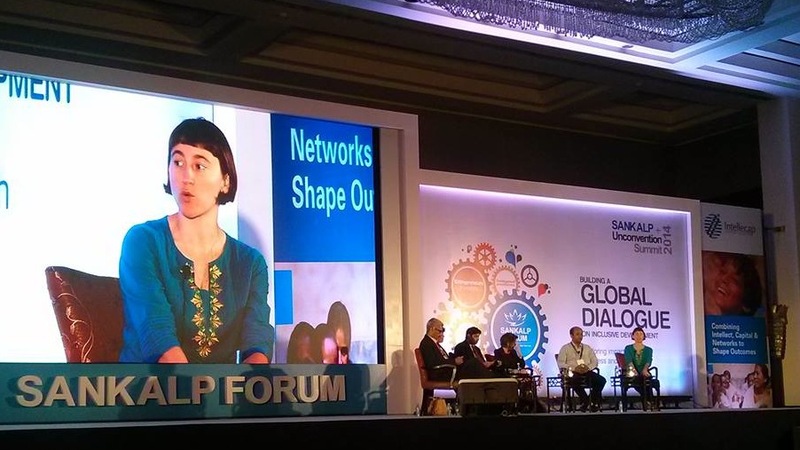 Above, Suzi Sosa, the co-founder and CEO of Verb, speaks during a panel session at the Sankalp Forum. Payal Shah is a business development manager in Acumen Fund’s India office.